While we were on our way to Providence, it was the usual Sunday scene that unveiled in front of us: people returning from the Sunday mass, children spending the Sunday morning playing around, mothers buying vegetables for tonight’s dinner and some sitting around to have a conversation with their friends. For us, volunteers of ELI Africa, that Sunday was different: We were on our mission to plant to 1000 mangrove propagules at Providence. 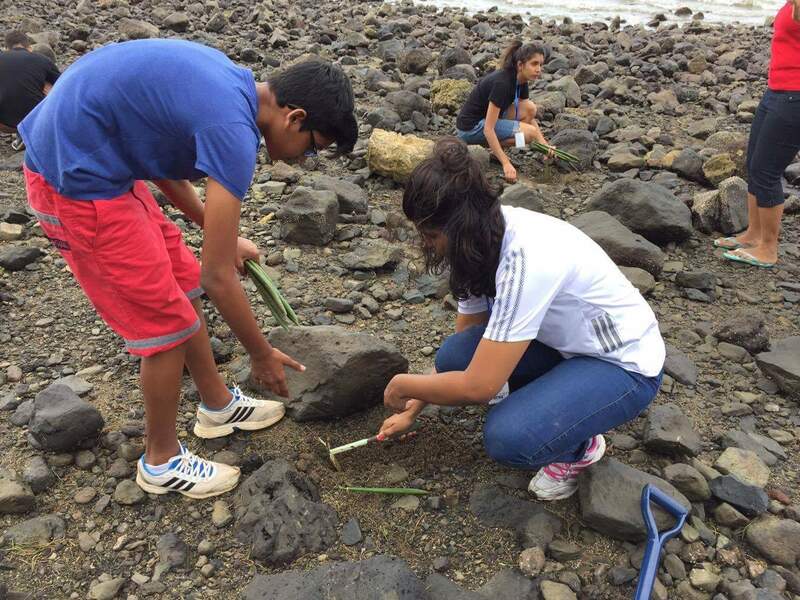 Our volunteers rallied once again their will power to make Mauritius more sustainable. We reached Providence at around 09 00 and after a briefing session with officers from the Ministry of Fisheries, we kicked off the planting event. Armed with proper tools and other equipment, our volunteers split themselves into groups. Each had a specific task: while one would dig the literally rocky land, another one would plant the propagules taking care to follow the guidelines given. You would be glad to know that we were not the only ones involved in the plantation. Intrigued by our presence at Providence, some inhabitants approached us to inquire about that activity. We then took time to explain them the objectives of our project and soon, they joined us to make a difference in their community. This was not only a boost to our zeal but it was also an accomplishment of one of ELI Africa’s objectives: to involve the local community at large in the conservation of our natural ecosystem. Planting over 1000 mangrove propagules is not an easy task, especially on a hot day and when our volunteers were involved in the collection of propagules and the ELI Wooff’s adoption day on the previous day. But when we think about how Providence will have a fully functional mangrove forest in 5 years and how our marine ecosystem will be positively impacted, we can’t be prouder of ourselves. After spending about 2 hours on the coast, we had an interactive session with the local inhabitants and those present at Providence Village Hall. It was an opportunity for us to pay tribute to Gaurav Dabeesingh, founder of The Mangrove Project,who left us last year and create awareness on the importance of mangroves’ conservation. Both our Founder, Vedant Seeam and the project leader at The Mangrove Project, Ritesh Isuri, talked about the importance of conserving mangroves for both the environment and the country’s economy. Having had the opportunity to spend his childhood with fishermen families, Vedant always talks to us about the struggle fishermen face each day to feed their family and how the depletion of our marine ecosystem has exacerbated the situation. He would always encourage us to engage with the community for the common good and on that day, we could not let him down. Thank you Vedant for leading the cause and inspiring us all the way long! Thank you Ritesh for making this event successful. Thank you Mr. and Mrs. Dabeesingh for supporting our cause. And THANK YOU to all our volunteers! You’re all amazing!